For urban dwellers constantly in motion, storage is essential. 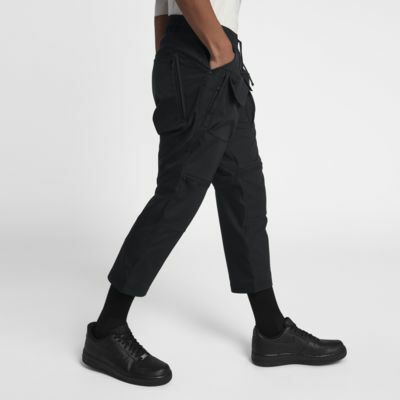 Boasting tons of different pockets, the NikeLab AAE 2.0 Men's 3/4 Trousers keep you outfitted for every day on the move. Stretch-woven fabric has a DWR (durable, water-repellent) finish to keep you dry. For urban dwellers constantly in motion, storage is essential. Boasting tons of different pockets, the NikeLab AAE 2.0 Men&apos;s 3/4 Trousers keep you outfitted for every day on the move. Stretch-woven fabric has a DWR (durable, water-repellent) finish to keep you dry. The NikeLab AAE 2.0 Collection is based on one question: How do people move? Built on body-motion research, the collection layers innovative performance technology with a soulful aesthetic for a capsule that&apos;s always moving forwards. Have your say. Be the first to review the NikeLab AAE 2.0.